These original lamps with high bright LEDs and DIY-formed wire provide impressive starry effect. Just put the string wire into bottle, stopper by the cap and your empty bottle will become a gorgeous lamp instantly without being thrown away. They are perfect to create romantic atmosphere in bar, home or party. DESK DECORATION: This lamp is made with a bendable wire that can be formed to any shape you want. 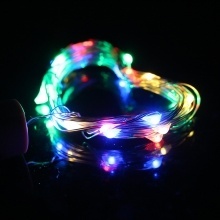 With DIY-formed wire, it is a unique decoration. BOTTLE STOPPER: Drop the wire into an empty bottle, stop it by the lamp base and you will have the bottle become a unique lamp. HIGH BRIGHT: High bright LED beads bring impressive starry effect. 1. Please choose bottle whose mouth is narrow enough to get the lamp stuck.